This easily walkable, blast-from-the-past town is surrounded by unspoilt natural countryside and is ideal for walking, cycling and horse riding. You could be forgiven for thinking you had been whisked back to days of yore when you visit Memmingen’s picturesque Old Town. With its towers, ten city gates and well preserved medieval walls, it drips with history. The Market Place, slap bang in the middle, bursts with character and is home to a rather grand selection of gothic and baroque buildings and richly decorated Rococo villas. See the glorious Siebendacherhaus, the House with Seven Roofs (Lindentorstrasse), Memmingen’s most distinctive house, once used by tanners to dry furs. Cross the old corn market, the Schrannenplatz, from where wheat and rye used to be distributed throughout southern Germany and you’ll come to the oldest wine-tavern in town, Weinhaus Zum Goldenen Löwen (Golden Lion) (Schrannenplatz 2), where a hefty cannonball under the gable bears witness to the siege of 1647. It’s a great place to sit outside and wind down as you glug a tankard of beer, munch some super-size freshly baked pretzels covered in rock salt (brez'n in Bavarian dialect) and people watch till your head spins. Resume your stroll and you’ll happen upon the Kreuzherren Monastery, one-time brothel. Its inhabitants, like the local executioner, whose duties included torture as well as the rather more mundane task of scrubbing the town walls, were considered social outcasts. Well not surprising really. A few doors along is the Treff Pilsbar (Kuttelgasse 20), where locals and visitors flock for a boozy Bavarian knees-up of an evening. It serves hearty, stomping portions of food, including every kind of sausage imaginable - after all, they are a big part of life here – and a huge variety of beers. 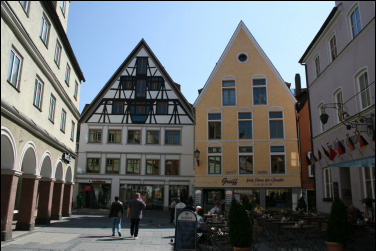 If all that Gemutlichkeit, not to mention the beer, is making you suffer, never fear, it’s not too far to the ‘Unicorn’ pharmacy, (Kramerstr33) dating from 1489. A fine name for a pharmacy, because unicorns were said to have healing-powers. You probably won’t be able to buy any unicorn horn powder these days, but they do sell paracetomol.